You’re Invited! New restaurant Santuari presents: The $5.00 “Santimosas”, a Special Fruit and Sparkling Wine Creation! There were 300 press releases posted in the last 24 hours and 153,385 in the last 365 days. Look for Santuari’s “Santimosas”, a Special Fruit/Sparkling Wine Creation (Blood Orange, Passionfruit, Pomegranate, Blackberry, Blueberry), Each For Only $5.00! LOS ANGELES, CA, UNITED STATES, February 20, 2019 /EINPresswire.com/ -- Nestled in the gorgeous city of Toluca Lake, SANTUARI RESTAURANT, an exquisite new venue offering fresh Californian cuisine with delicious Mediterranean accents, is welcoming guests this month and onwards for weekend brunches, which will take place 11:00 AM to 3:00 PM on Saturday and Sunday. 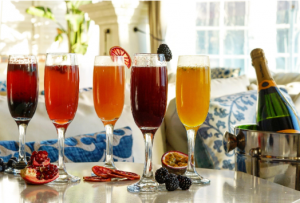 These brunches offer up a wide selection of delicious dishes and drinks, but the highlight of these is the new “Santimosa,” a Special Fruit and Sparkling Wine Creation (Blood Orange, Passionfruit, Pomegranate, Blackberry, and Blueberry), Each For Only $5.00! The “Santimosa”, a cousin of the Mimosa, comes in blood orange, passion fruit, pomegranate, blackberry, and blueberry flavors. Each Santimosa is only $5.00. Another featured drink is a house juiced Bloody Mary with Applewood Smoked Bacon. Not enough for you? Try a Strawberry Gelato coupe drenched with Spanish sparkling wine. "My favorite drink is the passion-fruit 'Santimosa,'" states Patrick Ramsey, owner of Santuari, "It's definitely the most unusual, but it tastes and even smells great. Our blood orange and pomegranate also seem to be favorites of our guests." "I recently had a ‘Santimosa’ on one of my recent visits to Santuari, and I was blown away," raves Ben S., a satisfied diner, "Each of the flavors was unique, but every single one of them brought something new to the table. Add that to the exquisite menu and atmosphere, and I cannot wait till I get the chance to come back and dine here again."